Family plays a big part in Everyday Hero Veturia Preston’s life. Veturia says her desire to give back comes from one beloved person. Veturia was born in Romania. At 10-years-old, her family escaped the country’s communist regime and fled to Germany. Veturia moved to the United States about 16 years ago and started doing volunteer work. A visit to the Salvation Army with her children led her to start her own organization, Our Daily Bread Tampa Bay. “It’s about finding food for those who can’t help themselves or finding food for those organizations that are short on those supplies that they need so they can continue doing the good work that they do,” Veturia said. Veturia also collects and funnels to other groups. She’s also helped Metropolitan Ministries. Karl Celestine, the Director of Outreach and Prevention Services, said she’s always there to help. “We have a wonderful relationship. She works extremely hard in helping organizations help families that have the greatest need,” Karl said. 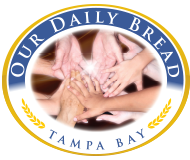 Our Daily Bread Tampa Bay is a non-profit that operates on individual and business donations.